Grant money helps students at Saluda River Academy for the Arts discover their artistic sides. 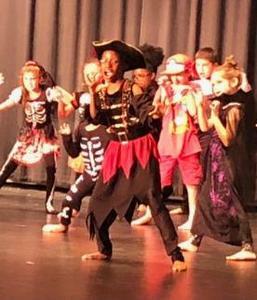 WEST COLUMBIA, SC – A $7,175 grant is helping students at Saluda River Academy for the Arts discover their art, dance, music and theater sides. Funds from the South Carolina Arts Commission recently supported four artists-in-residence at the school, giving students an opportunity to spend class time with professionals who are actively practicing as artists, dancers, actors, and musicians. Local groups that are helping with matching dollars to the grant include Title One Funds, PTO, theater and dance performance donations, fundraisers and more. Local residents have opportunities to enjoy the school’s performances. A Veterans Day performance is coming up Nov. 9, along with appearances at community events like Pine Ridge’s 60th Anniversary Festival, the Cayce Parade of Lights, The Lexington Choral Society, EdVenture, The South Carolina Theatre Association’s Youth Theatre Festival, and more. The school also takes the stage each spring in the Lexington Two Dance/Theatre Showcase, performing with several other schools including Busbee Creative Arts Academy, Brookland-Cayce High and Airport High. Grant funding for art enrichment opportunities has been keyfor for Saluda River’s students. “Students are engaged, interested, and motivated to learn,” McMillan said.